Hello dear Government job seekers, here we come with the new BEL Careers making opportunity to all the engineering degree holders. 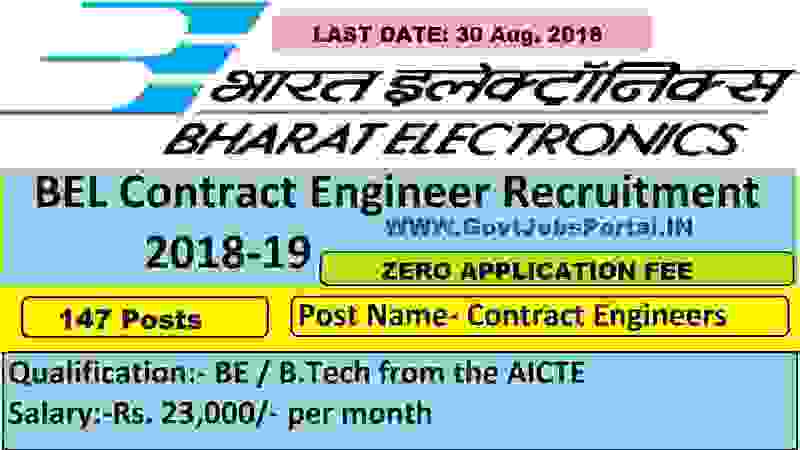 BEL Recruitment department issued an official notification related to this BEL Careers for Contract engineer posts. We come to know about this BEL Recruitment process through the official website. Bel department published the official notice related to this employment on their website. We have taken this Government jobs information from that PDF notice only and are sharing here with you readers. Bharat Electronics Limited, India’s is one of the premier Navaratna Defence Electronics Company under Government of India. This BEL organization requires Electronics, Mechanical, Electrical, and Computer Science Engineers on contract basis. More information related to this BEL Careers making opportunity is given below in this article. We try to make this information easy to understand for our readers. So read all the section carefully to understand each and every prospective related to this BEL Recruitment 2018. What are the eligibility criteria for applying this BEL Recruitment? Those who have a first class degree in BE / B.Tech under the following stream: “Electronics / Electronics & Communication/ Communication / Electronics & Telecommunication/ Telecommunication, Mechanical, Electrical, Electrical & Electronics and Computer Science / Information Technology / Information Science” can apply for this BEL Recruitment 2018. All Indian candidates having age less than 25 years can apply for this BEL Careers making opening. How much we have to pay for applying this BEL Recruitment? Indian government has offering ZERO application fee for applying this BEL Careers making opening. That mean all category candidates from India can apply for these government jobs without paying the application fee. How we can Apply for this BEL Recruitment procedure? Qualified aspirants can apply online for this BEL Recruitment process, for online application form you have to follow the official BEL’s website. The web address of the official website is (http://bel-india.in/). Candidates can start applying for these government jobs from 15th Aug. 2018 to 30th Aug. 2018. We also provide the Direct link for online application form below under IMPORTANT LINK section. Check that section for further more information related to this BEL Recruitment process 2018. 30TH Aug. 2018 is the LAST Date to apply. Disclaimer: We took this information from the following website: “ http://bel-india.in”.